The winter is already approaching Oregon and it's about time to start eating comfort-food type dinners that are satisfying, yet healthy! I know it looks complicated, but it's actually not! This dish is very easy to assemble, and I agree, there are a few steps on the way, but it is truly worth it! One of the most helpful tools to create healthy meals, is to plan. Planning is the key to create a sophisticated looking dish that is super easy and flavorful--and most importantly--something your family will love!!! Tip: you can steam the lentils the day before and keep in the fridge. You can roast both the eggplant, and the butternut squash the day before and keep in an air tight container. All is left to do the next day, is to assemble the dish, make the sauce and that's it! Take a large 10x14 inches Pyrex dish and spray oil. Put aside. In a baking sheet, spray some olive oil and lay the butternut squash with olive oil, rosemary, salt and pepper. You can drizzle with olive oil and make sure it's well coated, or you can spray the bottom and the top. Roast until golden but not completely soft. In a nonstick pan sauté the onion with the garlic, salt, pepper until golden brown. First, lay the roasted eggplants on the bottom of the Pyrex dish. Next the steamed lentils, Next the onion mixture, then pour the sauce mixture on top. Lastly, add the butternut squash, spread evenly on the top and bake at 350F for 50-60 minutes. When ready, let it set for at least 15 minutes before serving. 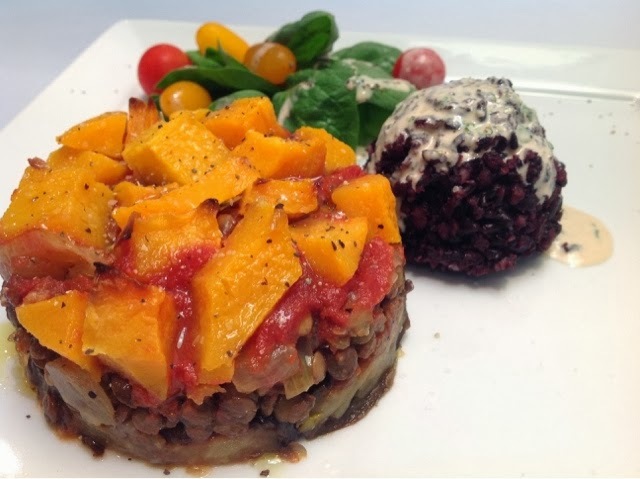 I chose to serve this dish with black rice, and home made tahini sauce. Black rice is a great way to feed your kids whole grain. Bring to a boil and than simmer for about 20 minutes until all the water have soaked into the rice.